A Japanese professor has detected all 3 isotopes of Plutonium at levels 200 times higher than Japan admits over 50 kilometers south of the Fukushima nuclear plant. You can view the spectrum data of gamma-ray with this SPViewer. As for the blue spectrum, plutonium (Pu-238, Pu-239 and P-240) Nozarasi’s griddle which is detected. 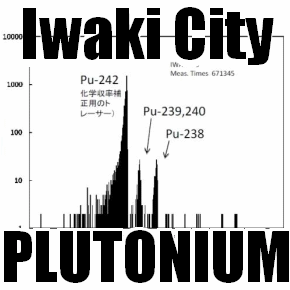 “Was the child continue to investigate patiently in the city of Iwaki iron lines and α in the blog’s “, has been detected (Pu-238, Pu-239, Pu-240) plutonium of trace from the iron plate of Exposed in the fields has been reported with was. Professor Masayoshi Yamamoto, Kanazawa University, Centre for Environmental Studies Japan Sea ring is inspected, from the results Pu238/Pu239, assertive and is derived from Fukushima Daiichi nuclear power plant from 240 radioactivity ratio was. In addition, Pu239, 240/Cs-137 radioactivity ratio has become 200 times the estimate of the government, as well as to distribution in plaques that radioactive iodine and radioactive silver, (the difference of behavior) also Fractionation plutonium and is presumed to exist if there has been. Personally infer about the emission ratio, and not of being also affects the distribution of (Np-239) is the parent nuclide of neptunium (Pu-239) plutonium. For neptunium from that half-life 2.36 Sun, which is the point I think from now on can not be proven is impatient It should be noted. We will send the measurement results. Pu is detected, and was surprised to be honest. Pu is already widely in the nuclear test, are distributed at low levels. With this Pu, Pu238/Pu239, 240 radioactivity ratio is about 0.03. This ratio is 0.8 this is clearly high, and contains the primary origin of Pu. Government estimates of emissions is 3.
you made ​​me think why and what ratio is low. It may also lower the ratio of Pu with 0.8 instead of all three has been released. Pu239, 9.0E-5 in the ratio of radioactivity 240/Cs-137, 200 times the government estimate of 4.3E-7, Pu has been detected and many more. It seems that it is for Fractionation (difference of behavior) is present perhaps. I think if you can analyze and Am-241 as well as uranium, if possible currently. Patience investigation was continued strongly in Iwaki city, there was report that with Î‘ line and [burogu] of the griddle, minute plutonium (Pu-238, Pu-239 and Pu-240) was detected from Nozarasi’s griddle. Governmental ceremony Mr. Yamamoto of the Kanazawa university ring Japanese sea area mental study center inspects, it was concluded that from the result it is something of Fukushima first nuclear origin from Pu238/Pu239,240 radioactivity ratio. Furthermore, Pu239,240/Cs-137 radioactivity ratio has reached 200 times that of estimator of government, when radioactive iodine and the radioactive silver are distributed to unevenness, that it is guessed whether in the same way, either plutonium is not that [hurakushiyoneshiyon] (difference of behavior) exists. 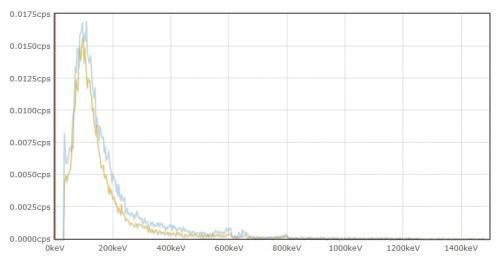 That you guess whether privately it is not to have an influence on also the distribution circumstance of the neptunium (Np-239) which is parent nuclide of plutonium (Pu-239) concerning discharge ratio. Furthermore concerning neptunium half-life 2.36 days from the notion that where you say, from now the point where it cannot prove is the thinking which the tooth is itchy. We send the measurement result. Pu was detected, the honest place was surprised. Pu is wide already with nuclear test, has been distributed low at level. This Pu being attached, Pu238/Pu239,240 radioactivity ratio is 0.03. The latest this ratio is high clearly with 0.8, includes Pu of nuclear origin. With discharge quantitative estimate of government 3 is. Why, that it is made to think whether ratio is low. Don’t you think? everything 3 are not and is also a possibility Pu which has the ratio whose [te] 0.8 is low being discharged. Furthermore Pu239,240/Cs-137 radioactivity ratio with 9.0E-5, reaches 200 times that of estimator 4.3E-7 of government, Pu is mainly detected. Perhaps it is thought that is, because [hurakushiyoneshiyon] (difference of behavior) exists. If presently the uranium, it is possible, if you can analyze also Am-241 and the like, you think.